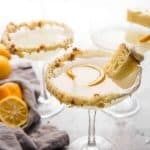 Soft, tender bread layered with creamy mascarpone and sweet Kahlua liquer served under a blanket of Kahlua infused cream cheese frosting. 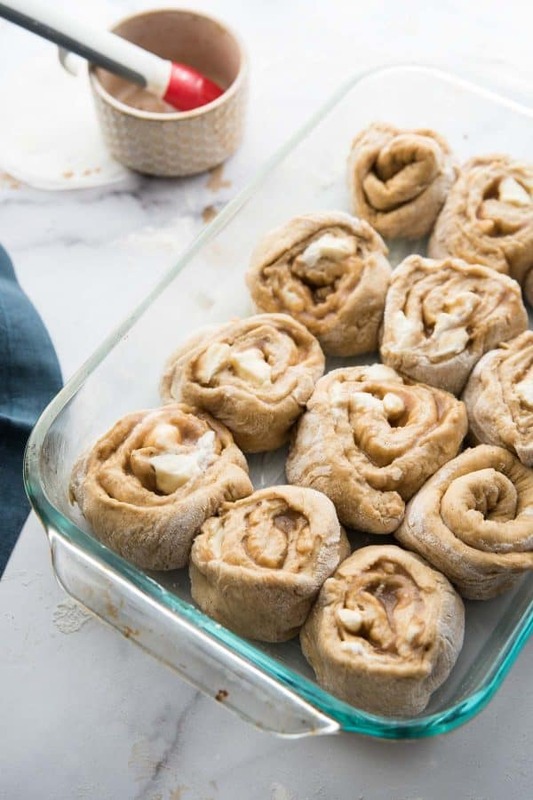 Tiramisu Cinnamon Rolls are the same classic rolls but with creamy coffee twist! It’s time for dessert fusion! 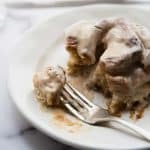 Today we’re mashing up two dessert classics into one fluffy, creamy, tender, sweet dessert that can also be served for a sweet breakfast treat if you’re so inclined. (I am so inclined). If sushi can become a burrito, then tiramisu can definitely become cinnamon rolls, right? Don’t ask me why, but if you served up slices of traditional tiramisu for breakfast for brunch you’d probably get some looks. I suppose it depends on the company. However, somehow, if you serve up sweet delicious dessert in bread form it some how becomes brunch acceptable. 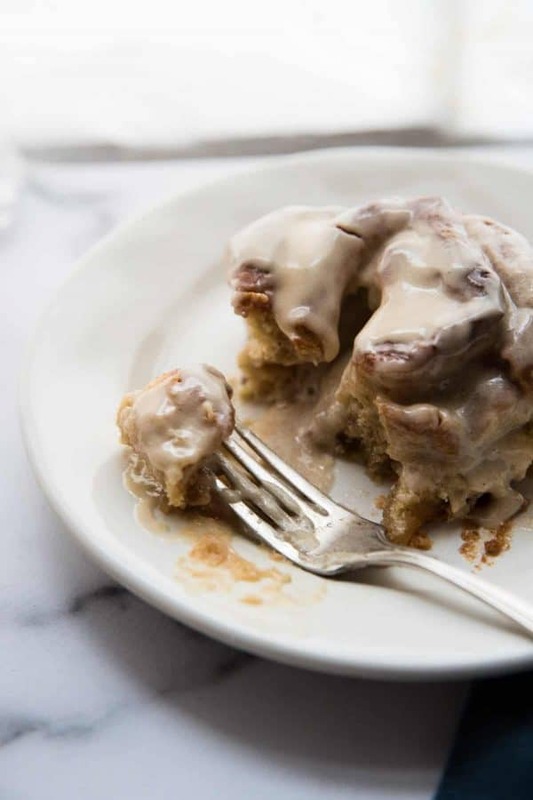 So, first order of business, tiramisu cinnamon rolls are your ticket to dessert for breakfast. Second reason, the dough for these rolls is one of my absolute favorite yeast doughs. Simple to make, it requires a rise in the bowl and then a second rise after the rolls are cut and placed in the pan. 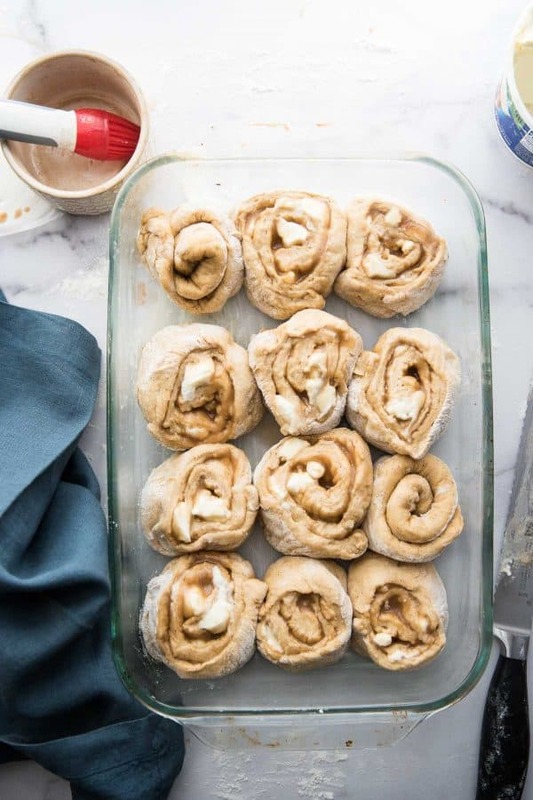 The result is flaky, super soft, dangerously easy to eat rolls that will also be soaked in creamy mascarpone, Kahlua cordial and a smidge of sugar. Like their traditional ladyfinger soaked counterpart, these rolls come with their own ‘Pick Me Up’ by infusing the dough with espresso. Oh, and let’s not forget. 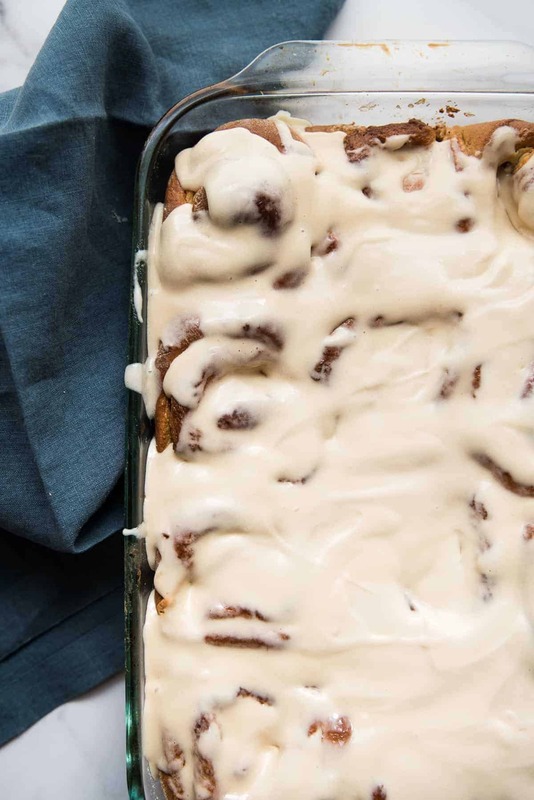 When these little beauts come out of the oven we’re going to slather them in sweet, tangy, and coffee liquer infused frosting because OF COURSE WE ARE. Start with getting that dough all yeasty, foamy, and fluffy. Buttermilk is a delicious start for that, it’s tangy and luscious. If you don’t have buttermilk – or don’t want to buy a whole container to use 1/2 cup – you can use whole milk. Side note: leftover buttermilk makes a wonderful marinade for chicken. The dough comes together easily in a standing mixer – no kneading involved yay! – then a double rise. Once in the bowl and then again once the rolls are cut and placed in the pan. 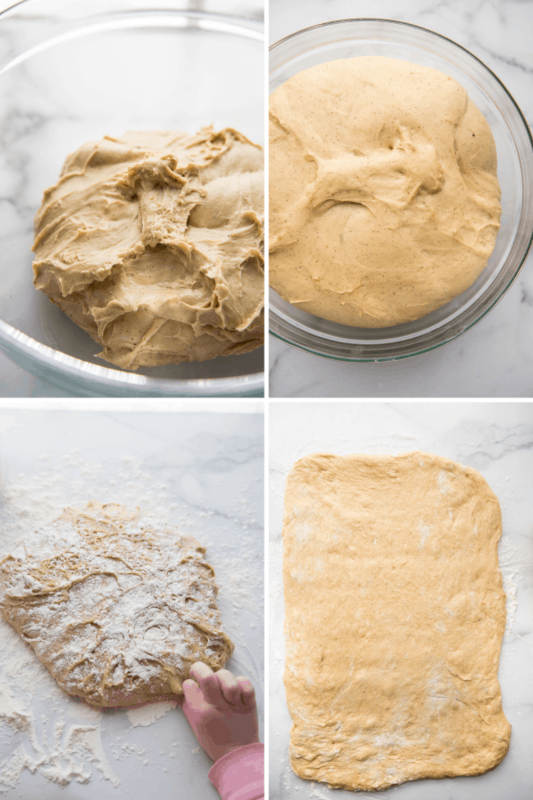 Once your dough is shaped into roughly an 18×12 rectangle, then the fun stuff happens. By fun I mean the butter, sugar, booze and cheese. Brush with butter and Kahlua, sprinkle with sugar, top with dollops of mascarpone. Tip: let the mascarpone come to room temperature to make breaking it into ‘dollops’ easier. You can do this with a spoon, but I find by hand to be the fastest, easiest way. Roll the dough as tight as you can. I like to save a little butter to brush on the seam of the dough (the outside edge) to help seal it. Cut the dough with a serrated knife or use a piece of fine string/thread to form 1″ rounds. You’ll want to brush the tops with a little butter before letting them rise. Keep your aluminum foil at the ready. Check the rolls a little over halfway through the baking. If the tops of the rolls are browning with a decent amount of time left, cover with foil until the baking is finished. While your rolls are baking, whip up the frosting. 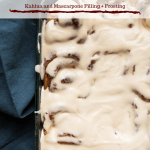 A simple combination of Kahlua, mascarpone, and confectioners sugar. Pour the frosting over the hot rolls once baking is done. My best recommendation is to cut one of out of the pan and enjoy before even thinking about sharing with anyone else….I mean, test it, make sure its up to par. 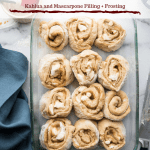 When these hot, sweet, coffee laced rolls are dished up enjoy the quiet while your pals or family sink their teeth into this tiramisu inspired treat! 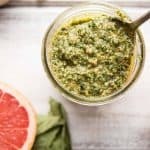 Make this recipe? Tell us about it in the comments! Prepare the dough: Heat the buttermilk over medium-low heat to 105°F to no more than 110°F. In a medium bowl combine the buttermilk, espresso and 1 tablespoon of the granulated sugar. Sprinkle with the yeast and let sit for 5 minutes until foamy. Whisk the eggs and vanilla into the yeast mixture until smooth. In the bowl of a standing mixer, combine the flour, remaining sugar (1/3 cup minus 1 tablespoon), salt, and espresso powder using the paddle attachment. With the mixer on the lowest speed, slowly add the milk mixture until combined. Increase the speed to medium-high for 5 minutes. The dough will be silky, smooth and have pulled away from the sides of the bowl. Once the dough has doubled in size, tip the dough out onto a well floured surface. Roll out into an 18″ x 12″ large rectangle. For the filling: in a small bowl, combine the melted butter and coffee liquer and brush all over the dough. 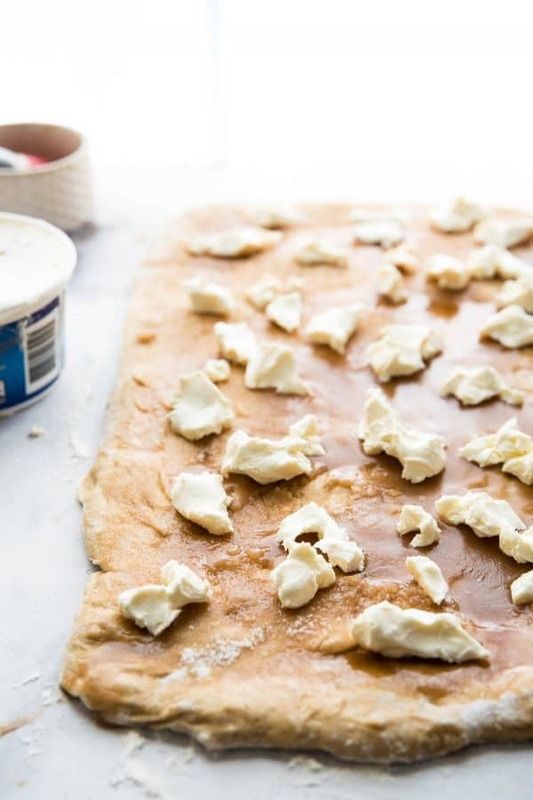 Sprinkle the granulated sugar over the dough, leaving a 1/2″ to 1″ border. Top with dollops of mascarpone cheese all over the dough. Tightly roll the dough from one long end to the other. Using a string or a sharp serrated knife, cut the dough log into 1″ rounds. Brush with 2 tablespoons melted butter, cover with a kitchen towel and let rise for 30 to 45 minutes in a warm place. Preheat the oven to 350°F. Bake the buns for 45 to 50 minutes – cover the buns with aluminum foil for the last 15 minutes of baking if they’ve started to brown by the 30 minute mark. Make the frosting: In a medium bowl, whisk together the softened mascarpone and powdered sugar. Add the Kahlua or coffee liquer and slowly increase the speed until the liquid is combined and a smooth frosting is formed. Pour the frosting over the freshly baked buns and serve immediately. If serving at a later time, reheat the buns in the baking dish then pour the frosting over just before serving. To speed up the rise process, preheat the oven to 200°F. Once preheated, turn the oven off. Place the covered bowl of dough inside and leave the oven cracked. The dough should be double in size in 45 minutes to 1 hour. 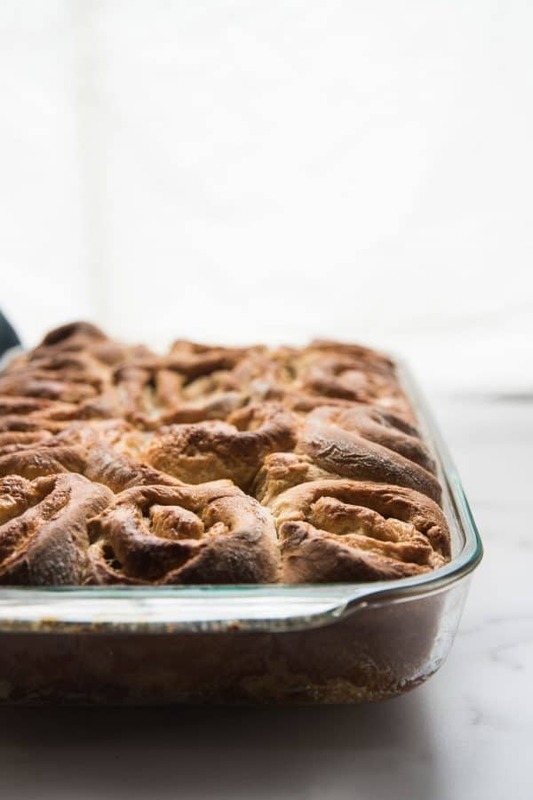 To speed up the second rise of the rolls once cut in placed in the baking dish, store the baking dish on top of the stove while the oven preheats (if your oven is located under your stove top.) Rotate about 15 to 20 minutes in so one part of the pan isn’t hotter than another. Leftover buttermilk is great in other baked goods, pancakes, or use as a marinade for chicken! I’m sorry, WHAT NOW?! God dammit, I’m never going to be bikini-ready for the honeymoon if you keep making stuff like this. Oh I love the twist you did on classic cinnamon rolls! My husband will absolutely love these! Guess I found what I’m making this weekend! Oh my gosh, how delicious and decadent!! 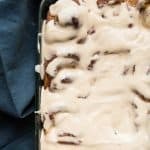 Tiramisu is so delicious – combining it with cinnamon rolls!? You’re a genius! I’ve got to try this soon! You’re right serving tiramisu for breakfast might get some strange looks. But not these cinnamon rolls. Holy moly. I wish I could reach into the screen and grab one! Going to have to try for my next brunch!! Fusion foods are the best and dessert fusions are at the top of the list for me! 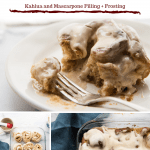 Your use of Kalua and mascarpone for a Tiramisu twist on cinnamon rolls is out of this world genius! Thanks for sharing this one! Uh… drooling over here! Cinnamon bun meets coffee? Yes please! 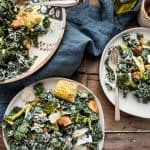 My husband is going to lose his mind when I make these for him! 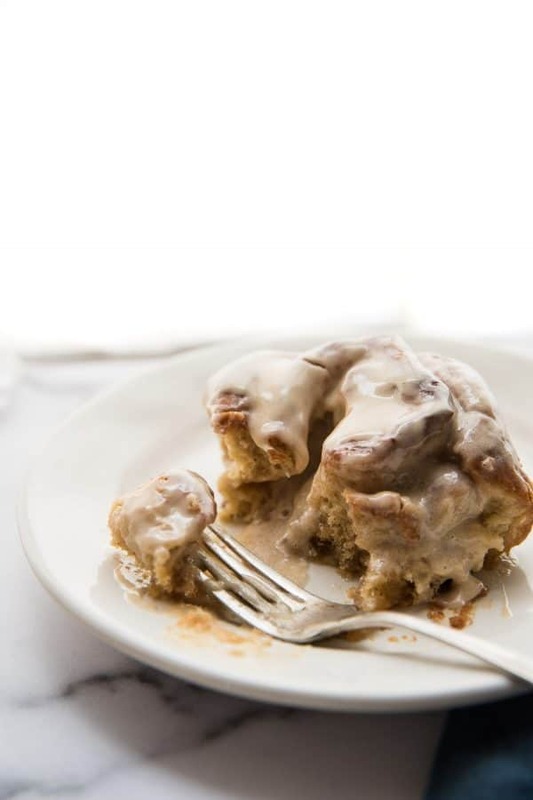 Cinnamon rolls are my breakfast weakness! These look perfectly fluffy and sweet too. 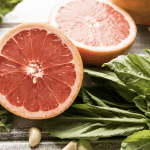 What a great way to spin the classic roll into something creative and delicious!